Kyle MacLachlan, Francesca Annis, Leonardo Cimino, Brad Dourif. Rolled - glossy UV coated. Size: 27 x 41 inches (68.58 cm x 104.14 cm). Condition: near mint-mint and unused. 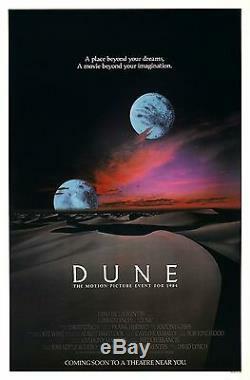 The item "DUNE (1984) ORIGINAL ADVANCE VERSION A MOVIE POSTER ROLLED GLOSSY" is in sale since Thursday, March 30, 2017. This item is in the category "Entertainment Memorabilia\Movie Memorabilia\Posters\Originals-United States\1980-89". The seller is "moviepostercenter" and is located in California. This item can be shipped worldwide.